..... Click the link for more information. ) he went to Pakistan where he helped to finance the mujahidin and to found Makhtab al Khadimat [services office] (MAK), which recruited and trained non-Afghani Muslims to fight in the war. ..... Click the link for more information. he became violently opposed to the Saudi monarchy and the United States. After he was caught smuggling arms in 1991, he went to Sudan, where he began financing terrorist training camps while investing in businesses and increasing his fortune. His Saudi citizenship was revoked in 1994.
, 1928–, president of Egypt (1981–2011). Air force commander (1972–75) and vice president (1975–81) of Egypt, he became president after Anwar al-Sadat was assassinated on Oct. 6, 1981. ..... Click the link for more information. . Bin Laden also was reported to have financed or trained Islamic guerrillas operating in Kosovo, Kashmir, the Philippines, and elsewhere. Outraged Muslims protested the killing of Osama bin Laden in Quetta, Pakistan. The CIA’s “Frankenstein monster” learned his lessons of terrorism so well that he was the most wanted man on Earth. Osama bin Laden was born in 1957 in Saudi Arabia, the son of a billionaire Saudi family. He inherited $300 million when his father died, and he amassed a great personal fortune on his own, as a well-connected businessman in the construction trades and in retail merchandising throughout the Middle East. Standing six feet four or taller, he covered his very thin body with the clerical robes of a spiritual leader. Conspiracy theorists see great irony in the bloody career of Osama bin Laden. In their view, he was the “Frankenstein monster” that the Central Intelligence Agency created. In 1979 bin Laden was recruited by the CIA to fight the Soviet invaders of Afghanistan as part of the largest covert operation in CIA history. The Agency utilized Pakistan’s Inter-Services Intelligence (ISI) as go-betweens, for in order for this covert action to succeed, none of the CIA’s efforts could be traced back to Washington. While there may have been some sympathy for the Afghanistan freedom fighters, the ultimate goal was to take a chunk out of the Soviet Union’s military forces. Bin Laden began funneling money to the mujahideen fighting the invaders and became closely associated with the Egyptian Jihad and other Islamic extremist groups. The CIA actively encouraged the rebel Muslims in Afghanistan to declare a jihad against the Soviets, and some 35,000 Muslim extremists from forty Islamic countries were drawn to fight the invaders of their brothers’ homeland. The CIA and ISI set up guerilla training camps in which combat techniques were integrated with the teachings of Islam. In the early 1980s bin Laden was actively involved in the camps to train freedom fighters to engage the Soviets, and he enlisted thousands of recruits from Saudi Arabia, Algeria, Egypt, Yemen, Pakistan, and Sudan to continue the struggle against the enemies of Islam. The CIA and ISI were rewarded for their covert efforts by eventually influencing over 100,000 foreign Islamic radicals to support the resistance to the Soviet invasion. In March 1985 President Ronald Reagan signed a National Security Decision Directive that increased covert military aid to the Muslim resistance. The success of the covert operation can be gauged by the responses of Muslim extremists after the Soviets had withdrawn; many later said that they had no idea they were fighting the war on behalf of the United States. Although there were contacts at the upper levels of the intelligence hierarchy, the Islamic rebels in the field never suspected that it was the Americans who were supplying them with sophisticated weaponry and training them to become more effective warriors. Even the very clever bin Laden once admitted that he had seen no evidence of American assistance in the war against the Soviets. The Soviet Union withdrew its troops in 1989, but the civil warfare in Afghanistan continued without missing a beat. The Taliban (the name translates simply and ironically as “students”), supported by various factions within Pakistan, eventually were able to install a hard-line Islamic government in Afghanistan. At the time, the Taliban Islamic State served America’s geopolitical interests. The Afghan opium trade was financing and equipping the Bosnian Muslim Army and the Kosovo Liberation Army, so Washington turned a deaf ear to the cries for assistance from the reign of terror imposed by the Taliban. 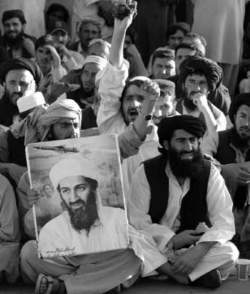 In 1988 bin Laden founded al-Qaeda to unite Arabs who fought against the Soviet invasion in Afghanistan. It wasn’t long, however, before he came to believe that al-Qaeda should be the champion for the over one billion Muslims in the world who feel that their complaints have not been heard by the West. After a truck-bombing of a U.S. military complex near Dhahran, Saudi Arabia, in 1996 killed nineteen U.S. airmen and wounded 515 people, including 240 Americans, bin Laden reaffirmed his call for a jihad against Americans: “We have focused our declaration of jihad on the U.S. soldiers inside Arabia,” he said during an interview with CNN, but he warned that other attacks were imminent because of the U.S. government’s “extremely unjust, hideous, criminal acts” in support of the Israeli occupation of Palestine. The influence of Western decadence threatens Arab fundamentalist cultures in the Middle East and other heavily Islamic parts of the world. Americans have manipulated Arab politics and ignored nearly seventy years of demands for reparations for Zionist atrocities in Israel and the “theft” of Arab land in Palestine. The arrogance of some of those who took that land made Arabs feel unwelcome in their former homeland. The historic Western exploitation of Arab oil until Arabs formed their oil cartel. The prejudice against Arabs around the world for their religion and cultural beliefs. The desire of Arab fanatics to force the whole world to accept Islam and become an international Islamic theocracy. According to some students of bin Laden’s evolution to the world’s most notorious terrorist, the act that enraged him enough to put his threats into action might have been the August 19, 1998, U.S. missile strike in Sudan of a target that turned out to be an innocent aspirin, powdered milk, and baby food factory. The blast killed 167 Muslims praying in a nearby mosque, including at least one of bin Laden’s relatives. Bin Laden then expanded his terror network and declared a fatwa (a religious opinion or judgment issued by a qualified scholar or a religious leader) decreeing jihad against America. He immediately gained 100,000 new volunteers. Bin Laden was placed on the American Federal Bureau of Investigation’s lists of Ten Most Wanted Fugitives and Most Wanted Terrorists for his involvement in the 1998 U.S. embassy bombings. After the 2001 bombing of the Trade Center, the FBI placed a $25 million bounty on bin Laden’s head. Conspiracists offered proof that the secret government was watching over the bin Laden family by the fact that twenty-four American members of the bin Laden family, along with over one hundred other highly placed Saudis, were flown out of the United States just after the bombings on 9/11 without being questioned. Osama bin Laden was able to evade U.S. forces during three presidential administrations. But on May 2, 2011, the fugitive leader of al-Qaeda was shot and killed inside a private residential compound in Abbottabad, Pakistan, by U.S. Navy SEALS and CIA operatives in a covert strike ordered by President Barack Obama. Within hours, bin Laden’s body was prepared for burial according to Muslim religious laws, and he was buried at sea. Al-Qaeda acknowledged the death of their leader and spiritual mentor on May 6, 2011, and vowed to retaliate against Americans wherever they might be found all over the world. Bin Laden had not been given last rites, and his body had been buried at sea for little more than a few days when conspiracy theorists began circulating their theories. They believed that the assassination of the master terrorist had not gone down the way the official U.S. report stated. Some insisted that Osama was still alive, having escaped the raid on his home. Others repeated a theory that had been popular long before the SEALS dispatched the terrorist leader that stated that bin Laden had died of health issues many years ago. Top al-Qaeda personnel had kept alive reports of bin Laden sightings as a propaganda tool. Even alleged CIA agents had spread the rumor that bin Laden had died of marfan syndrome in Dubai in July 2001. A big problem that the official reports of bin Laden’s assassination had lay in the fact that no photographs of his body were made available to the media for distribution to the general public. Adding to doubts of bin Laden’s death was his burial at sea. Skeptics around the world demanded to see the body as the ultimate proof that bin Laden was truly dead. Conspiracy theorists also made much of the vast discrepancies in the reports of the shootout at bin Laden’s mansion with the SEALS. Initial reports gave a play-by-play of a forty-minute gunfight with bin Laden’s bodyguards before the SEALS seized the compound and killed the chief terrorist as he attempted to use his wife as a human shield. Later accounts mentioned only one man defending bin Laden when the SEALS stormed a rubbish-strewn compound rather than a multi-million dollar mansion. Skeptics also made an issue of the interviews conducted with neighbors of the bin Laden compound in Abbottabad after the raid. The majority of the interviewees swore that they had never seen bin Laden in all the years that he was supposed to have resided there, and they were unaware of any evidence to prove that he had ever lived among them. It seemed especially strange that bin Laden could live undetected in the town for so many years when Abbottabad serves as a staging ground for the Pakistani military, which is the Pakistani equivalent of West Point. For all the world knew, people argued, the White House could have selected nearly anyone to serve as a faux bin Laden for the SEALS to kill and bury at sea. Conspiracy theorists have believed for many years that Osama bin Laden was very useful to elements of the secret government. When the world has had enough of fighting terrorists, so the conspiracists state, the populace will turn to the New World Order as their salvation from chaos. In the meantime, defense contractors are getting richer and richer, the military more and more powerful.